MASSEY FERGUSON MF 5430 - summary: tractor, scale 1:24, 663 pieces made of high quality metal and high quality plastic material, free-wheel action, tires with original patterns w/ soft plastic, including trailer tow hitch, weight of tractor is 1.0 kg, build in full details, all parts will be only fixed with screws and locked with nuts, including MASSEY FERGUSON-decals, equipped with tools for assembling, instruction manual with pictures for easy assembling, recommended for age 8plus together with parents, packed in a gift box, from tronico. 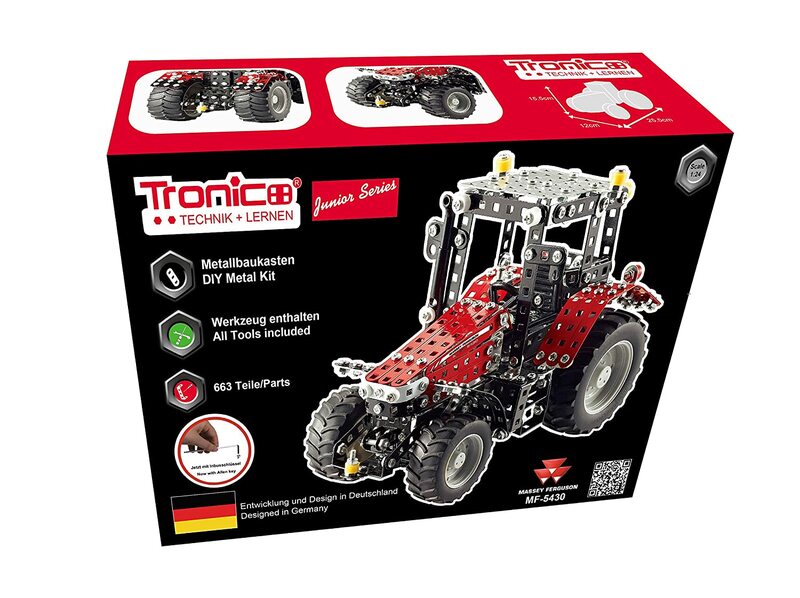 Detailed description: The new discovery of metal construction kits. Exclusive with tronico. With licenses of the original models. A real must for the avid model builder. With this model we want to appeal to even the small model makers from eight years on. The assembly is less complicated due to not having to assemble the steering and the much smaller number of parts (app. 600-700) compared to the "big brother" MF 8690 (app.1000-1100) bring along a much faster success of completion. The MASSEY FERGUSON MF 5430 tractor is modeled after its original fully made of metal. The scale is 1:24 and the MASSEY FERGUSON MF 5430 tractor from tronico is screwed together from 663 single parts. It is fully functional. The soft plastic profile tires are equipped with free-wheel. The weight of the tractor is 1.0 kg and thus provides a very detailed design. All parts are screwed together with nuts and locked individually. The material of tronico is made from high quality metal and plastic. It comes supplied with a MASSEY FERGUSON MF 5430 sticker which after completing the assembled model makes it a true original MASSEY FERGUSON MF 5430 tractor model made of metal. In the cardboard box next to the material you will find tools for assembly, assembly instructions and a colorful picture with control side views of the ready assembled product. We at tronico highly recommend the age of 8plus together with the parents, better 10 years.